The Felix Project was founded by Justin Byam Shaw as a way of solving the twin problems of food poverty and food waste. Food poverty is a huge and growing problem. Meanwhile 10 million tonnes of perfectly good food goes to waste each year. The Felix Project collects good quality food from suppliers like us and delivers it to charities so they can give vulnerable people a healthy meal or snack. By saving food that would otherwise go to waste, The Felix Project is also saving lives. 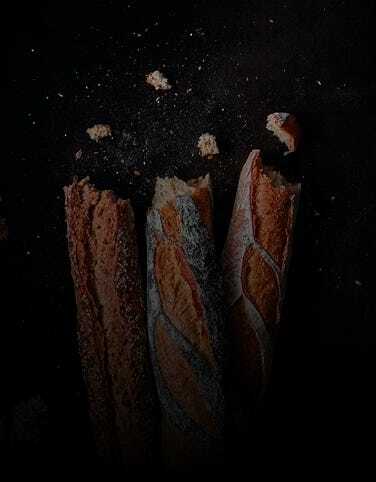 We began simply by donating unsold bread from our stores. Every day, the van from the Felix Project would turn up and the amount of bread we were able to donate depended on that day’s sales. We decided to even out the daily fluctuations in what was available by turning our left-over bread into good old-fashioned bread pudding, adding dried fruit and sugar. Our bread pudding proved so popular with vulnerable people visiting shelters that we were asked to donate more, and now we make 14 big tins of bread pudding at l’atelier every day. Often the bread pudding is on the Felix Project van 30 minutes after it comes out of the oven. Since we started making bread pudding we have used 5 tonnes of bread, more than 3 tonnes of dried fruit and 750kg of sugar! 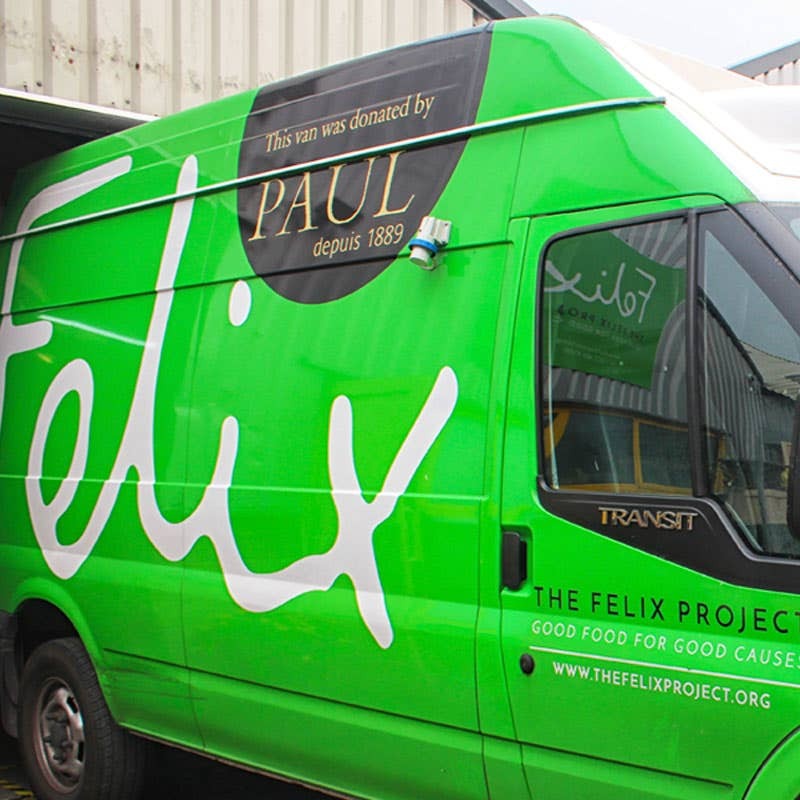 In December 2016 we asked our customers to help, donating 50p to The Felix Project for each 400g or larger loaf we sold, raising enough money for the charity to buy another delivery van, now driving around London with our logo on it. In June 2017 The Felix Project launched Refettorio Felix at St. Cuthbert’s church hall in Earls Court. Every day for the first month or so some of the country’s best known chefs volunteered to cook a meal at this marvellous community kitchen, all using donated food. PAUL staff also volunteered to help in the kitchen and to serve meals. For Christmas 2017 we again asked our customers to help, this time raising £13,280.00 for the charity from bread sales, and a further £1,365 from adding £1 to customers’ bills in our two restaurants. Also in December members of the PAUL team again volunteered to help out at Refettorio Felix, serving lunch to the people who come to the church to have a healthy, sustaining meal and sit and relax in the warm. It was great to talk to everyone and tell them that we made the bread pudding they were eating and to see how much they were enjoying it. Starting this month, we are also baking briochettes for The Felix Project’s Help a Hungry Child campaign. 1 in 10 children in the UK are living with parents who struggle to put food on the table. The fresh briochettes we bake every day are collected by The Felix Project and distributed to three primary schools which have been selected because they have a high proportion of pupils who haven’t had anything to eat at the start of the day. We will continue to help The Felix Project with the wonderful work that they do in helping disadvantaged adults and children to get access to high quality food, and would like to extend our grateful thanks to our bakers, our team members and of course, our customers, for their support.